Looks Good Works Well: YANNI - Yet Another Ninja Needed Immediately! YANNI - Yet Another Ninja Needed Immediately! UPDATE! I have hired 2 Engineers! So this role is filled. However, I have another opportunity... read it here. 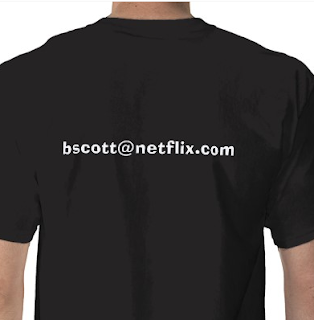 Another new opportunity at Netflix as of today (1/4/2010)! But if you are interested please contact me at the email shown on the t-shirt. You can find more out about this position at the Netflix Jobs site. Will focus on the acquisition/non member side of the web site. Exciting new opportunity as we move to our first international offering. 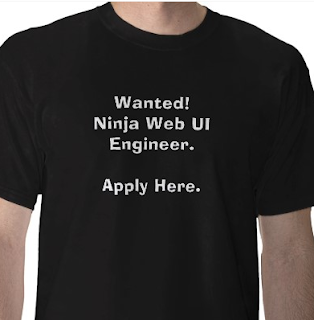 Not a User Experience Designer role, but a Web User Interface Engineering Ninja. 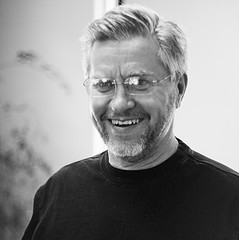 Expert level in DHTML and general Computer Science skills required. Not a remote position and not relocating internationally (but will relocate the right candidate within the US). Part of the User Interface Engineering Team and as such reports to me. Are you wearing this out and about? Has anyone approached you f2f? Is the netflix website the best way to apply? Would you mind if i sent you an email directly?